It's not as complicated as it looks. In November of 1998, Lana released her first Ballad Collection CD in Japan. Two years later in November of 2000, she released a second CD in Japan containing all new material entitled Ballad Collection II. Then in December of 2000, Think Tank Media released a double CD containing BOTH volumes entitled Ballad Collection Special Edition. This release is intended to be a truly Special Edition and hopefully the definitive version. 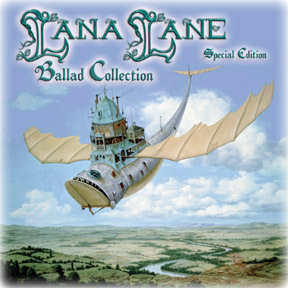 This release contains ALL of the recordings from the two Ballad Collection single CDs along with a bonus track: Lana's magnificent cover of Marillion's "Seasons End", previously available only in Japan. Total running time for disc one is 57:22, disc two 52:14. That's almost 110 minutes of music in total with no repetition! The 2-disc set is packaged in a Slimline jewel case along with a stellar 20-page booklet with full color throughout. The booklet contains all of the English text from the single CD editions along with additional liner notes by producer Erik Norlander. Several color photos are also included. The cover art image is by Judson Huss who painted the fantastic cover art on the Erik Norlander - Into the Sunset CD. (The same painting appears on the Japanese Volume Two edition, although the Lana Lane and title logos are different as you can see in the images above.) The back of the Special Edition booklet also contains the astounding Jacek Yerka painting from the Japanese Volume One edition cover. Our idea with this release is to provide as complete an edition as possible. Pseudonym Records in Holland has released a near-identical version of the Ballad Collection Special Edition. The only noticeable difference between the Pseudonym European version and the American Think Tank Media version is that the Pseudonym European version is packaged in the thick-style double CD jewel case instead of the Slimline 2CD jewel case. 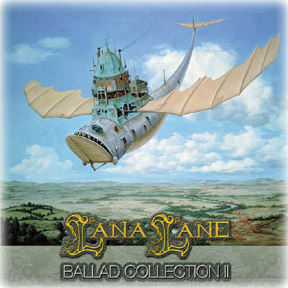 This is the original Lana Lane Ballad Collection from 1998 which we have now necessarily dubbed as "Ballad Collection Volume One". Like the Ballad Collection Volume Two, it is only released as a Japanese edition. The single CD contains 10 tracks along with a 16-page booklet with full color throughout. The booklet contains all of the lyrics in both English and Japanese along with liner notes by producer Erik Norlander. The cover art image is by Jacek Yerka who painted the fantastic covers for all of the Lana albums from 1995-1999 (everything up to Secrets of Astrology, which has cover art by Michael Parkes). Of the 10 tracks, 7 are all new recordings and 3 are remixes from Lana's Curious Goods album along with some additional overdubs. Here's some advice from the albums' producer Erik Norlander: "Hmm. It looks a bit complicated, doesn't it? Okay, here's my suggestion. If you don't own ANY of these, by all means get the Special Edition double CD either from Think Tank Media or from Pseudonym in Europe. But if you already have the 1998 Ballad Collection [Volume One], then you only need to get the Japanese Ballad Collection Volume Two to complete the set. I know that the number of editions looks daunting. Sorry about that!" This release is a unique collection of material designed to feature the angelic and passionate vocals of Lana Lane in a more intimate and demur setting than her usual studio albums. Although these intimate moments certainly occur at times on the other albums, only here do we get the opportunity to fully immerse ourselves in this deeply ethereal atmosphere. The first disc in this Special Edition package contains all new recordings made during the late summer of 2000 following on the heels of Lana's Secrets of Astrology album. The second disc contains music from 1998 which was released only in Japan as the "Lana Lane Ballad Collection". This 1998 Japanese release was a huge success for Lana, catapulting her even further into the limelight in that country. We offer here that complete album along with one additional track from that era, Lana's beautiful rendering of Marillion's "Seasons End". While Lana's previous release, Secrets of Astrology, was recorded in Holland using mostly European musicians, we decided to contrastingly record these new songs close to home here in Los Angeles with our familiar team of local players in order to make a clear distinction between the recent projects. Neil Citron happily returns to the Lana Lane family with his tastefully fluid guitar solo stylings, and again Mark McCrite strums acoustic guitars and adds his trademark harmony vocals. Tony Franklin joins us once more on his signature fretless bass and also plays some great ethereal tremolo electric guitar, and our favorite stick figure Don Schiff plays the rare and compelling Chapman Stick and N/S Stick instruments adding exotic tones and kinetic lines. Greg Ellis, who played percussion on the 1998 Disc Two recordings, now makes his Lana Lane drumkit debut here on Disc One with his spacious and emotive touch. Lastly, we are happy to welcome for the first time Lana's very own brother Greg Phelps who sings impeccable harmony vocals in the family tradition as well as playing some sublime accordion. As I mentioned above, Disc One contains all new recordings of several new original Lana Lane tracks and a great selection of cover songs of which Lana and I have been fans over the years. While perhaps some of these cover songs will be known to you, we hope that many of them you will hear on this album for the first time. The first song is "Nether Lands", an epic orchestral ballad written and originally performed by singer/songwriter Dan Fogelberg on his album of the same name. Contrary to what you might think from the title, this song is not about Holland! While The Netherlands as a country is certainly one of our favorite places in the world and home to many dear friends, this particular song alternatively employs the more literal usage of the term meaning simply "lower". In this case, the lower lands are the earth below the sky above, from where Lana sings to the heavens about her dreams, desires, hopes and fears. That said, we are still happy to have the ambiguity imply our own subtextual reference to Holland. Next comes "Hands to Heal", which is the newest recorded Lana Lane song composed by the writing team of Tully Winfield and Don Schiff. The Winfield/Schiff team has given us the past Lana Lane classics "Under the Olive Tree", "Let Heaven In", "Take a Breath" and "Cold Outside", and we are proud and grateful to perform another of their creations on this release. The third track on the album is the Elton John classic "Goodbye Yellow Brick Road", which is perhaps a subtle reference to the song "Emerald City" on the Lana's Curious Goods CD from 1996. Lana and I both agreed that she would sound perfectly at home on this song, and that with only subtle arrangement changes it would make a brilliant Lana Lane track. Aside from adding guitar and synth solos, the main arrangement change from the original Elton John version is the substitution of Hammond organ for Elton's piano. Don Schiff's aerobic Stick work also is a standout on this version. Following comes a somewhat epic medley of two new original Lana Lane compositions: "A Place in Time" and "The Rivermaid". Lana had been working with these pieces beginning back during the Secrets of Astrology pre-production sessions where she could be often found under the elderly oak tree in our back yard strumming her acoustic guitar and serenading the dogs and other woodland creatures with these two beautiful melodies. As I would hear the songs effortlessly flow from one to the next, we decided to produce the tracks in a similar way -- as one long, peacefully fluid journey. As precedents for this kind of compositional blending, Lana and I talked about the classic songs "Breathe" and "Time" from Pink Floyd's Dark Side of the Moon and also of "Carry On" and "Questions" by Crosby, Stills and Nash. Mark McCrite's 12-string guitar work effortlessly captures the spirit of Lana's vision for the piece, elegantly delivering the placid pastoral mood of the medley. Next comes the rocker "Ghost Beside My Bed" featuring the unbridled fretless bass madness of Tony Franklin. Tony was given instructions to "stretch out a bit on this one", and before we knew it, smoke was emanating from the speakers and recording console. We knew then that we had uncaged a monster. Of course, this was a monster that we were happy to welcome to the album. As artists, we must constantly challenge ourselves. The proof of this simple statement can be readily found in the subsequent track "To the Last Whale ..." originally written and recorded by David Crosby and Graham Nash on their album Wind on the Water. The CN album title is taken from the second part of this song, beautiful in its own right, but the real workout for us came with the first part, "Critical Mass" (which, by the way, is no relation to the song of the same name that appears on my instrumental Threshold album from 1997). Lana and I figured out all of the vocal parts from the Crosby/Nash CD, and I then transcribed them into four distinct parts. Enter Greg Phelps, Lana's brother. We flew Greg down from Northern California to help with this tremendously challenging piece, as we felt that we needed an astounding vocal blend that perhaps only a family member could provide. The warm vocal sound of Lana and Greg together is a deeply lush texture previously unheard on any album and one we are pleased to present here for the first time. "The River Maid" is the third new Lana Lane composition on this album and is another elegantly spacious audio fairytale. The song is based on a short story by Jane Yolan and continues in the fairytale tradition of "The Bell" from Secrets of Astrology. The River Maid is an enigmatic young girl who is plucked from the river by a local landowner who unknowingly brings havoc to the region by removing the soul of the river itself. All becomes right again only when the River Maid is returned to her watery home. Over the years, a few of us lucky ones have been at family gatherings, school reunions and other special occasions where Lana has spontaneously performed a jazz standard. I have always found the pairing of Lana's velvety tone and a venerable classic song to be a truly magical combination, and so we have finally recorded one here on this Ballad Collection. "Autumn Leaves" combines the charm and depth of composition from the first half of the twentieth century with the more familiar "space groove" that has graced such past Lana Lane pieces as "Leaving Stardust", "Reverie" and "Dream of the Dragonfly". An extra special element of this recording is the wonderfully melodic and brilliantly kinetic connoisseur guitar solo of Neil Citron. Next comes a song that I particularly enjoy, Tom Waits' "Innocent When You Dream". This track is almost reminiscent of several styles, yet wholly similar to none. It has elements of modern blues, of nightclub jazz, even of Irish drinking songs, but to classify it solely as any of these would be erroneous and certainly incomplete. While Lana as a vocalist certainly has little in common with Tom Waits, I had heard this piece several years ago and instantly imagined Lana singing it. A strange and unlikely connection perhaps, but I believe the result is a success and hopefully expands Lana's artistic range a bit. The album is closed by the Supertramp opus "If Everyone Was Listening" which originally appeared on their classic album Crime of the Century. Clearly Supertramp has produced some great songs over the years, and there are many that are significantly more popular, but this particular song seemed to fit the style of this album well, and it also provides a rather theatrically moody platform on which to end the record. The lyrics fall close to our hearts -- I think any artist who truly has a love for music and performance can intimately relate to the words "Don't let the curtain fall". As artists, it is a tenuous existence that we lead, and we are grateful for every moment on the stage, never really knowing when our final act will play. 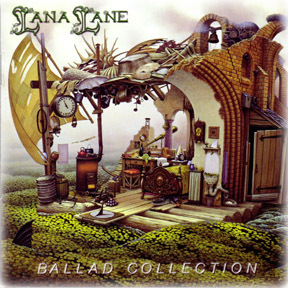 The 1998 Japanese release of the Lana Lane Ballad Collection blossomed from an initial idea to create a "Best of Lana Lane" album following the release of her first three full - length studio albums (Love is an Illusion, Curious Goods and Garden of the Moon) and one 33-minute mini-album (Echoes from the Garden). Our friend Naohiro Yamazaki at the Japanese Avalon label suggested the idea of a collection of the best ballads from these albums plus some new tracks. We set about the task of recording three new songs, which, through some serendipitous momentum, quickly turned into nine new songs. The first track we recorded was "Avalon", which originally appeared on the debut Rocket Scientists album, Earthbound. Since by this time we had played this song for over five years since the 1993 release of Earthbound, its arrangement and feel had evolved significantly. In addition to the same four Rocket Scientists musicians that played on the original Earthbound version, this new Lana Lane version also features guitarist Neil Citron, who adds a unique rock dimension to the track. The final touch on the new recording is the remarkably fluid viola from Novi Novog (also heard on the Secrets of Astrology album) who brings some beautifully passionate cascading melodies to the track. Another Rocket Scientists track on this collection is "Stardust", which has always been associated with Lana Lane since she sang much of the original 1995 recording. This original recording first appeared as the bonus track on the Japanese version of the Rocket Scientists - Brutal Architecture CD and then appeared again in a subtly alternate version later in 1999 as one of the bonus tracks on the European version of the Rocket Scientists - Oblivion Days CD. The version of "Stardust" presented here is a completely new recording made in 1998. It differs a bit from the Rocket Scientists versions especially in the verse piano parts as well as the very stylized Neil Citron guitar solo. An elegantly spacious track is "Athena's Shadow", which was written solely by Lana Lane on acoustic guitar. The mostly acoustic arrangement is built around Lana's original guitar ideas, executed on the record by Mark McCrite. Subtle but effective use of string harmonics by Neil Citron and Don Schiff on acoustic guitar and acoustic bass respectively enhances the mysterious mood of this piece. I consider the "Studio Acoustic Version" of "Through the Fire" contained herein to be one of the definitive Lana Lane audiophile tracks. Shimmering acoustic guitars from Mark McCrite constrast with several tracks of hand drums and shakers from Greg Ellis, supported by the acoustic bass of Don Schiff. Novi Novog again appears, adding dynamic and melodic viola parts that color the track with a decidedly acoustic brush. This recording came to pass out of the April, 1998 tour of Japan that resulted in the Lana Lane Live in Japan album. During that tour, "Through the Fire" was performed acoustically with only Lana, Mark McCrite and Neil Citron onstage. For the studio version, we added the percussion, viola and Mellotron to the arrangement to give the track more depth and color. And of course the vocals and guitars benefitted from being captured in the controlled environment of the recording studio. There are a few cover songs on this album which I believe fit in nicely. First is Jeff Lynne's "When Time Stood Still", which was originally released as an outtake from the Electric Light Orchestra "Time" album in 1981. Lana, Mark McCrite and I have always been fans of this song, and its harmonic similarity to "Stardust" made it a suitable choice to include on the Ballad Collection. The sweeping motion of Mark's acoustic guitars combined with the Mellotron flutes creates a warm, yet otherworldly atmosphere. Adding to the mystique is the aerobic percussion of Greg Ellis whose instructions where to create the feeling of "a metronome gone wild". Another cover song on this collection is the Beatles' "Across the Universe" which features Greg Ellis and Tommy Amato both playing simultaneous percussion creating a spacious drive and a wonderful feeling of depth. This track builds from start to finish as more instruments enter in each section. Notice that the drumkit does not begin playing until more than halfway through the song! I find the melody of this track to be unforgettable, and I think that the generally feeling of the song is very consistent with "Stardust" and "When Time Stood Still". To keep the focus clear, all three of these songs where deliberately recorded and mixed together within three days time. The third cover song is "Clouds", which originally appeared on Lana's second album, Curious Goods, from 1996. I chose to remix some of the Curious Goods material for the Ballad Collection as that original version of the album had a more dry and direct sound that differred from the subsequent Lana Lane albums which became more spacious and dimensional. In addition to "Clouds", this collection also contains new, enhanced versions of "Heart of Dawn" and "Take a Breath". Since these three songs were to be remixed, We took the opportunity to add new acoustic guitars from Mark McCrite, who did not appear on the original Curious Goods CD. Mark also sang harmony with Lana and Tully Winfield on this new version of "Clouds", and Don Schiff added cello to the track as well. Unique to "Clouds" is the simultaneous appearance of both Lana Lane bassists: Tony Franklin plays fretless bass and Don Schiff plays cello. Also of interest, "Take a Breath" was co-written by Don Schiff, but he does not play on the track -- bass duties were performed by Tony Franklin due to a scheduling conflict with Don at the time of the intial Curious Goods recordings. Closing the album is the "Avalon Reprise", which was spontaneously recorded live in the studio by myself, Mark McCrite, Tommy Amato and Don Schiff in July of 1997 prior to the first Rocket Scientists European tour. We ressurected this track one year later in 1998 for the Japanese Lana Lane Ballad Collection, and we completed it by adding alternating guitar solos by Neil Citron (panned left) and Mark McCrite (panned right) over lush harmony vocal pads by Lana, Mark and Tully Winfield. Adding yet another musical dimension to the Lana Lane catalog, I hope you enjoy this Special Edition release as we do. It is a special glimpse into one corner of the Lana Lane sound, elements of which will certainly be heard on future albums, but are presented here with a clear conceptual focus in a specific sonic light. I wish you many happy listenings!